September has come to an end, and so it’s time for my Month-in-Review post. September was a productive month for blogging. I reviewed a total of 9 books, 3 of which counted toward the R.eaders I.mbibing P.eril challenge. I also welcomed Brandon Engel for a Guest Post on H.P. Lovecraft. For at least the next few days, I will have a lot more time for reading and blogging than anticipated. As someone whose job is contingent on federal funding, I’m out of work for the duration of the shutdown. Hopefully it doesn’t last very long. I’m trying to count my blessings and use the spare time well, but it’s a stressful and annoying situation to be caught in. 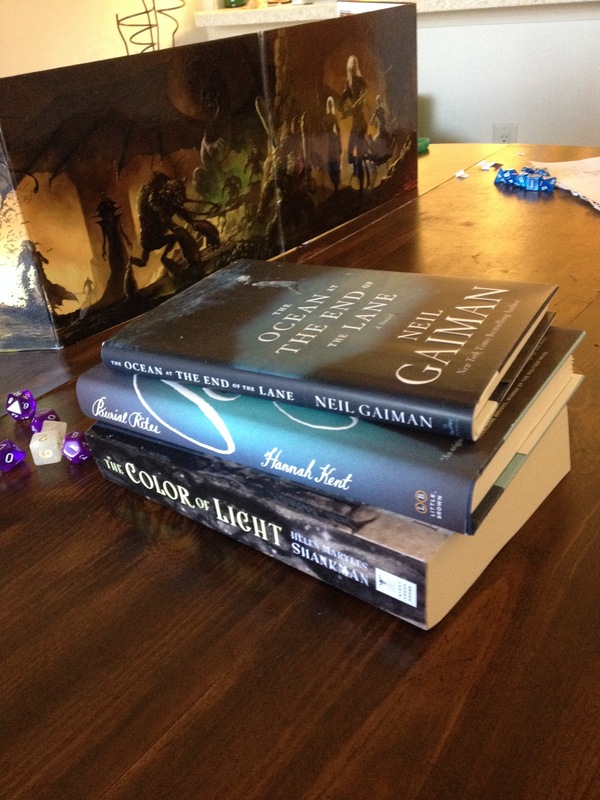 “The Ocean at the End of the Lane” by Neil Gaiman – I won this in a giveaway at The Blog of Litwits. I’ve heard lots of good things about it, and you can’t go wrong with Neil Gaiman. “Burial Rites” by Hannah Kent – This is a review copy of a book about an Icelandic murderess awaiting execution in the 1800s. It’s either going to be amazing or horribly depressing. I’m putting my bets on amazing. “The Color of Light” by Helen Maryles Shankman – Part of a TLC Book Tour. The books is about vampires, Nazis, and art, which seem like a winning combination. I’m hoping while furloughed to make a serious dent in my TBR pile, as well as to start catching up on reviews. I’ve got a queue of about ten books that I’ve read recently but not written about yet, and now seems like an opportune time to work on them. What are your October reading plans? Have you gotten any new and exciting books lately? Hello everyone! August has been a successful blogging/reading month. Now that I’m back to blogging solidly again, I’d like to start monthly wrap-up and housekeeping posts again. This weekend, I’m going to Pennsylvania to go camping with my family for Labor Day weekend. As I’ll be in the middle of nowhere, there will be no internet (or even cell phone service, for that matter, unless one stands on a particular picnic table and the wind is blowing in just the right direction). It will be a nice opportunity to relax and get away from the world. I’ll also be turning 25, which feels a bit surreal. Any posts this weekend will be scheduled, but I’ll be back for discussions on Monday. I managed to review six books throughout the past month. The winner of the giveaway of Koethi Zan’s The Never List is Patricia. Congratulations! During August, I participated in my first ever readathon, during which I read a total of five books in the span of one week. I began a sixth book, Days of Blood and Starlight, which I’ve since finished. I loved Bout of Books because it gave me an excuse to push myself to make more time for reading instead of doing “important things” like laundry or cooking dinner. I can’t wait for the next Bout of Books, which takes place in early January. Thanks to Bout of Books, I’m now something like 10 books behind on reviews. This month’s goal is to catch up on writing reviews, while at the same time participating in one of my favorite reading events of the year. That’s right, it’s time for Carl’s R.eaders I.mbibing P.eril, VIII, which begins on September 1. The event focuses on ghosts, ghouls, and things that go bump in the night. Generally, this is where I’d make a reading pool, but I know from experience that even if I did, I won’t stick to it. Instead, I’m going to challenge myself to read/review at least five RIP-themed books throughout the duration of the event. I’ve already gotten started with Terri Windling/Ellen Datlow’s Snow White, Blood Red, a collection of dark faerie tales that include stories written by some of my favorite authors, including Neil Gaiman and Charles de Lint. The few stories I’ve read so far have been excellent, and I can’t wait to share my thoughts on them. – Historical fiction from the perspective of a former slave who has close contact with the Lincoln family. – Set in Turkey. I don’t know nearly enough about Turkey, so this will be a learning experience. – Cat Valente is one of my favorite authors, and when I saw she had released a new collection of stories and poems inspired by Japan, I ordered it from Amazon immediately. – My impression when reading the blurb is that the book explores social issues within the context of their impact on a community. Happy New Year to everyone, and thank you for the well wishes and for understanding when I decided to take a hiatus from blogging. While I haven’t responded to everyone, I read all of your comments, and I appreciated them tremendously. Balancing school and work has been difficult this year, but there is a light at the end of the tunnel! I have two classes this spring and one in the summer, and then I’ll finally have my master’s degree, at which point I shall celebrate. Being a librarian is awesome, and even though I have less time for my hobbies (like blogging), I’m incredibly satisfied with my work, and I learn something new every day. I also keep coming across new books that I’d like to read (I’m thinking that “The Immortal Life of Henrietta Lacks” might be one of those sometime in the near future). In the new year, I’d like to return to blogging on a limited basis. I probably won’t be posting 10+ times a month like I used to, but I’m thinking that twice a month would be a reasonable goal until I’m graduated. I miss discussing books with all of you! I’m not planning on participating in any major year-long reading challenges right now, mostly because I don’t know how much time I have to commit to them. However, I am planning on participating in Carl’s not-a-challenge, The 2013 Science Fiction Experience. This event lasts for two months and involves reading/reviewing sci-fi novels on a casual basis. I think I can handle that. I’d also like to participate in Andrea’s Vintage Sci-Fi month. I’m hoping to get a couple posts made up before the semester gets too crazy, and I can’t wait to see what all of you have been up to! Announcement time! I’ve posted a relatively small number of reviews this month and even skipped a groupread that I had signed up for, as my personal life has been incredibly busy. After spending the past two years job-hunting, I finally found one! I’m a real librarian now! This will mean that I will have a bit less time for blogging. I’ll schedule a couple reviews each week, but they’ll be a bit more spread out, and hopefully more consistent. I’m still planning on participating in the readalong of “The Graveyard Book,” because I need more Neil Gaiman in my life. I’ve have the book on my Kindle ready to go. For all of you that I’ve promised reviews, they’re still coming! I didn’t forget about you, there are just a lot of things that I have had to do this month, such as shopping for appropriate work clothes and keeping up with grad school. 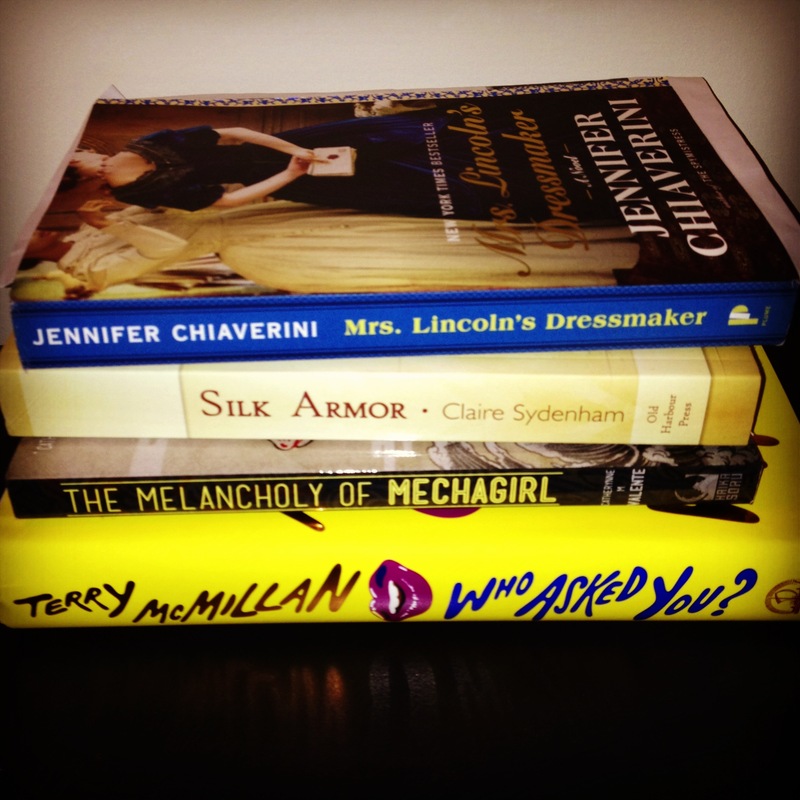 I’ve reviewed every book that I read since I started my blog with the exception of textbooks. I’m about eight reviews behind right now, and I’m hoping to catch up as soon as I possibly can. As far as October reading plans go, I’m going to focus on playing catch-up with reviews and then getting in the mood for Halloween. I’m hoping to read Dracula before the end of the month, as a friend and I have tickets to see it as a ballet on Halloween night. I love going to the ballet, and I’m intrigued by the prospect of vampire ballerinas. How’s your month been going? Any exciting reading plans? During August my blog hit the milestone of reaching more than 50,000 overall views. I want to thank all of you for making it possible; when I started blogging, I never thought that anyone would read what I had to say. September’s going to be a busy month. The new semester has begun, and this time I’m taking classes on Archival Management and IT in Libraries. I’m scheduled to participate in two blog tours toward the end of the month. One is of Alex Bledsoe’s pirate novel entitled “The Wake of the Bloody Angel,” and the other is of Giles Christian’s “Blood Eye,” which is a fantasy novel about Vikings. I’m looking forward to reading both titles! September is also the start of R.eaders I.mbibing P.eril VII, hosted by Carl from Stainless Steel Droppings, which will involve reading gothic/horror/spooky fiction, as well as some readalongs. 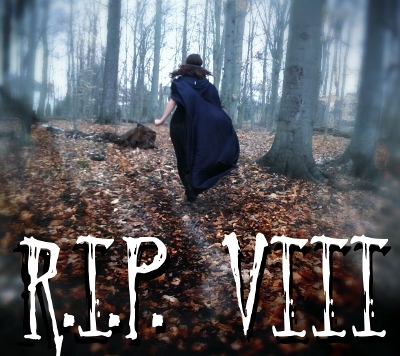 See RIP VII: Intro Post & Reading Pool for a basic idea of what I’m hoping to read over the next two months. Normally I would list some of my recent book acquisitions in my month-in-review post, but this month I haven’t bought any new books. Mostly it’s because it’s been at least a hundred degrees for much of the past month, and so I’ve been spending most of my time reading in the air conditioning. Walking or taking public transit to a bookstore just doesn’t sound appealing when it’s this hot outside. When it cools down a bit outside I’ll start visiting my local bookstores again. Luckily, I have a lot of review copies of books being released in August/September/October, so I’m in no danger of running out of reading material at any time in the foreseeable future. My goal for August is to spend most of it reading and relaxing, as classes start up again on the 28th. As far as reading plans go, this month I’ll be participating in my first TLC blog tour, during which I’ll be discussing Irina Lopatina’s “White Raven.” I just finished reading Rachel Neumeier’s “The House of Shadows,” so I should have a review up within the next few days. I’ve also got an author interview scheduled for next week with Debra Dean that will coincide with the release of her book The Mirrored World, which I read and reviewed earlier this summer. Yay! This weekend also begins the final groupread in Brandon Sanderson’s Mistborn trilogy. See here for more information or to sign up. This groupread is being done blog tour style, with one blogger hosting the discussions each week. Book Expo was an amazing experience, and was great for networking with both authors and publishers. I learned more about blogging and the book industry during those three days than during the entire year that I had been writing my blog. I’m hoping to get caught up on writing reviews during the first half of July. Remember when I said that I wasn’t going to buy any more books after BEA for a very long time? Well, I lied. In my defense, a storm knocked out power (and the air conditioner and fridge, which still aren’t up and running yet) this weekend, and Barnes & Noble was air conditioned. I came across a copy of Catherynne Valente’s “Deathless” and am already quite enamored of it. I mean, what kind of book would suit me more than a beautifully written fairy tale set in Soviet Russia? I started reading it in the store and decided that it must come home with me. I also ended up picking up a couple Kindle books over the past few weeks. I decided to purchase Deborah Harkness’ “A Discovery of Witches,” as I have the sequel among my BEA books and wanted to read them in order. I bought Catherynne Valente’s “The Girl Who Circumnavigated Fairyland in a Ship of Her Own Making,” because yeah. Cat Valente is my new hero. I also picked up L. S. Engler‘s first book, a collection of short stories entitled “Bowlful of Bunnies,” which is delightful thus far! So… um… yeah. Maybe this month I’ll be more successful in stopping myself from buying new books, but somehow I doubt it. What are your reading plans for July? Found any good books lately?